River Ave. Blues » White Sox 4, Yankees 1: Sometimes you get beat by … Ryan LaMarre?!? White Sox 4, Yankees 1: Sometimes you get beat by … Ryan LaMarre?!? Dropping series at home to teams on pace for 98 losses is no way to go through life, folks. Bad game, bad series. The Yankees dropped Wednesday night’s series finale 4-1 to the White Sox. It’s their first series loss at home to Chicago since 2005. The ChiSox had been the last remaining American League team without a series win at the new Yankee Stadium. … had his second career multi-extra-base hit game. … had his seventh career game with an extra-base hit period. … drove in a career high four runs. … had his first career multi-RBI game. How annoying. LaMarre struck first in the second inning. CC Sabathia allowed back-to-back singles to start the inning, then recorded two outs and got ahead in the count 0-2 on LaMarre. He was on the verge of stranding both runners. Then Sabathia left an 0-2 cutter up in the zone and LaMarre drilled it to right field for a two-run double and a 2-0 lead. 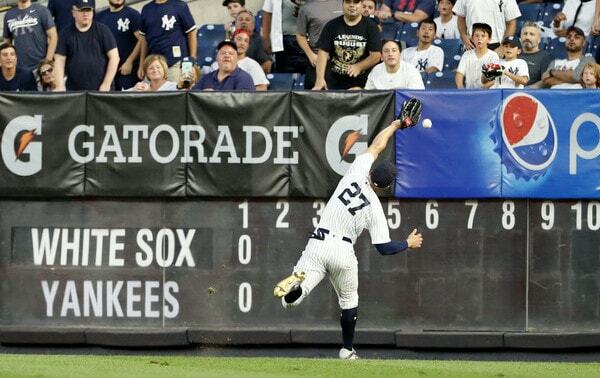 Giancarlo Stanton and his one good hamstring almost made the lunging catch near the wall, but alas. Egads. Two singles, a double, and a walk on elevated two strike fastballs, which for Sabathia means a cutter. He did get one fly out and a jam shot ground ball on two-strike cutters. Otherwise the White Sox turned those mistakes into runs. LaMarre’s two-out, two-strike, two-run double was a real letdown. Sabathia was a pitch away from stranding those two leadoff singles. No dice. LaMarre burned the Yankees again in the fourth inning. 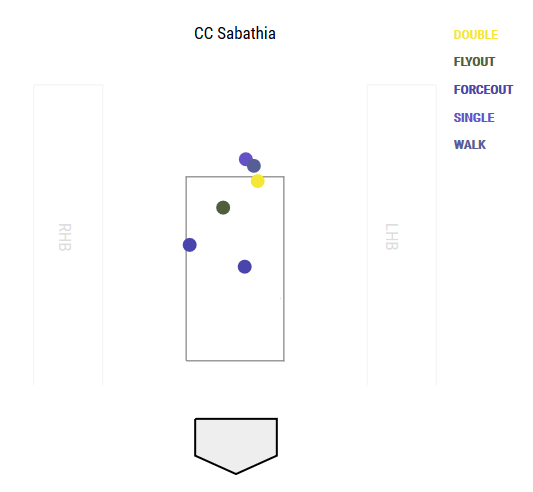 Sabathia walked Yoan Moncada on four pitches with one out, then left a 1-0 cutter out over the plate to LaMarre, who drove it to left field for a double. The speedy Moncada scored from first with ease given there were two outs and he was off and running on contact. LaMarre also added an (opposite field!) solo homer against Chad Green in the seventh. He drove in all four White Sox runs. Dude. Sabathia was mostly fine against non-LaMarre hitters. His line: 6 IP, 5 H, 3 R, 3 ER, 2 BB, 6 K on 91 pitches. According to James Smyth, the Yankees dropped to 51-6 when getting a quality start this season. That’s not just the best record in baseball. It’s the third best record when getting a quality start since 1913, behind the 1931 Athletics (78-9) and 1932 Yankees (69-8). That is bonkers. The Yankees had their best (only, really) chance to make this a ballgame in the fifth inning. They were trailing 3-0 after hitting what felt like rocket after rocket after rocket at defenders for four innings. Their first four batted balls of the game: 96.5 mph line out to left, 97.0 mph line out to third, 104.7 mph line out to second, 100.1 mph line out to right. Man. One of those games. The Yankees had eight batted balls at 95+ mph go for outs Wednesday. Anyway, in that fifth inning Neil Walker and Gleyber Torres led off with back-to-back singles, then Austin Romine drew a one-out walk to load the bases. ChiSox starter Reynaldo Lopez went breaking ball, fastball, breaking ball, fastball, breaking ball against Ronald Torreyes. Torreyes took the first two breaking balls in the zone for called strikes. He was ready for the third breaking ball and pulled a ground ball single to left to score a run.
? After the game Aaron Boone said he was totally cool with Gleyber going home there because the ball went to the backstop. It just took an unfortunate bounce back to catcher Kevan Smith and the throw was right were it needed to be, he added. Strong, strong disagree. Look at the replay. Torres didn’t get a good secondary lead at all and he hesitated before breaking home. With the bases loaded and Stanton up, once you hesitate, you have to hold. Gotta let the big man hit there. Instead, the final out was made at home with the bases loaded. G r o s s.
Also, the Yankees put on a clinic stranding leadoff runners this game, holy cow. Greg Bird’s leadoff double in the third inning was wasted. Stanton’s leadoff walk in the sixth was wasted. Gleyber’s leadoff single in the seventh was wasted. Miguel Andujar’s leadoff single in the ninth was wasted. The Yankees put the leadoff man on base five time in nine innings and scored one run. Gardner, Stanton, and Aaron Hicks (i.e. the 1-2-3 hitters) went a combined 0-for-11 with a walk. Tough to score when they do that. Thanks to LaMarre’s home run against Green, the bullpen has now allowed at least one run in seven of the last eight games dating back to the 12-inning game in Miami last week. Green has allowed eight home runs in 62.2 innings this season. He allowed four homers in 69 innings last year. A.J. Cole and Tommy Kahnle, the only when losing relievers, each struck out two in a perfect inning. Scary moment in the seventh inning. Torres was spiked in the left thumb applying the tag on Yolmer Sanchez’s steal attempt. It wasn’t intentional. Just a bang-bang play and Gleyber’s glove was in the wrong place and the wrong time. He has a cut but did stay in the game and even stroked a single in his next at-bat. He’s fine, apparently. And thankfully. The White Sox leave town and another AL Central team comes to the Bronx. The Yankees open a four-game series with the Tigers on Thursday night. Veteran left-ballers J.A. Happ and Francisco Liriano will be on the mound in the series opener.